Here is a list of LA City Parks. Mountain biking is not allowed in any of them, not even on dirt roads. 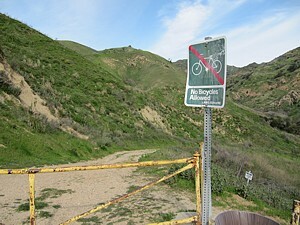 In LA City Parks, mountain biking is only allowed on pavement, not on dirt roads nor dirt trails. 6th and Gladys Park 6th & Gladys St.
48th St. and 8th Ave. Park 2929 W. 48th St.
113th Street Park 1607 E. 113th St.
Angels Gate Park 3601 Gaffey St.
ARDMORE RECREATION CENTER 3250 San Marino St.
ARMAND HAMMER 601 Clubview Dr.
Averill Park 1300 Dodson Ave.
Bee Canyon Park 13150 Sesnon Blvd. BENNY H. POTTER WEST ADAMS AVENUES MEMORIAL PARK 2413 Second Ave.
Beverly Glen Park Angelo Dr. & Baywood St.
BIRD SANCTUARY 2900 N. Vermont Ave.
BISHOP CANYON 929 Academy Rd. Blythe St. Park 14740 Blythe St. BOND AREA Los Feliz Blvd. Brand Park 15174 San Fernando Mission Rd. Branford Park 13310 Branford St.
BRONSON CANYON 3200 Canyon Dr.
Browns Creek Park Browns Canyon Rd. Burns (Robert L.) Park 4900 Beverly Blvd. CAREY RANCH Laurel Canyon Blvd. & Aztec St.
Carthay Circle Park McCarthy Vista and Wilshire Blvd. CENTRAL AVENUE POCKET PARK Central Ave. & 42nd Ave.
CETA FOREST 5201 Zoo Dr.
Chase Park 22525 Chase St.
Chatsworth Oaks Park 9301 Valley Circle Blvd. Chatsworth Park North 22300 Chatsworth St.
Chesterfield Square Park 1950 W. 54th St.
Cheviot Hills Park 2551 Motor Ave.
Chevy Chase Park 4165 Chevy Chase Dr.
Circle Park 76th St. at 5th Ave.
City Hall Park Center 200 N. Main St.
Cleland Ave. Bicentennial Park 4800 Cleland Ave.
COHASSET-MELBA PARK On Cohasset St. and Melba Ave.
Coldwater Canyon Park 12601 Mulholland Dr.
Crestwood Hills Park 1000 Hanley Ave. CRYSTAL SPRINGS 4730 Crystal Springs Dr.
Culver/Slauson Park 5070 Slauson Ave.
Cypress Park 2630 Pepper Ave.
Arminta St. and Golden State Fwy. De Longpre Park 1350 N. Cherokee Ave.
Dearborn Park 17141 Nordhoff St.
DELANO PARK 15100 Erwin St.
Devonshire/Arleta Park Arleta Ave. and Devonshire St.
East L.A. Park 2500 N. Eastlake Ave.
East Wilmington Vest Pocket Park 1300 "O" St.
ECHO PARK 1632 Bellevue Ave.
Eddleston Park 11820 Reseda Blvd. El Paseo Cahuenga Park 3300 Cahuenga Blvd. El Sereno North Park 4410 Garden Homes Ave.
Encino Park 16953 Ventura Blvd. Erwin Park Erwin St. and Ethel Ave.
EXPOSITION PARK 3980 S. Menlo Ave.
Finn (Howard) Park 7747 Foothill Blvd. FOUR OAKS PARK Foothill Blvd. / Machrea St.
Ave. 63 & Meridian St.
GENESTA Park 16953 Ventura Blvd. Gibson (John S., Jr.) Park Harbor Blvd., between 5th/6th. GRAPE STREET POCKET PARK 10726 S. Grape St.
South Terminus Haines Canyon Ave.
Harbor Highlands Park 825 Capitol Dr.
Harold A. Henry Park 890 Lucerne Ave.
Hart (WILLIAM S.) Park 8341 De Longpre Ave. Hazard Park 2230 Norfolk St.
Hollenbeck Park 415 S. St. Louis St.
Holmby Park 601 Clubview Dr.
HOPE AND PEACE POCKET PARK 843 S. Bonnie Brae St.
HOWARD FINN PARK 7747 Foothill Blvd. Humphrey (Hubert H.) Memorial Park 12560 Fillmore St.
JOAN MILKE FLORES PARK 3601 S. Gaffey St.
JUNTOS PARK 3135 Drew St.
King (MARTIN LUTHER, JR.) Blvd. Mini Park 416 East Martin Luther King Blvd. King (Martin Luther, Jr.)Park Lanark St. & Shelby Pl. LAKE HOLLYWOOD PARK 3160 Canyon Dr.
Lanark/Shelby Mini Park Lanark St. & Shelby Pl. LATHAM PARK Latham & 53rd St.
Laurel Canyon Park 8260 Mulholland Dr.
LELAND PARK 863 S. Herber Ave.
Libbit Park 5101 Libbit Ave.
LILAC TERRACE PARK 835 Academy Rd. Limekiln Park 10300 Limekiln Canyon Rd. Lincoln Park 3501 Valley Blvd. Little Landers Park 10116 Commerce Ave.
Lookout Point Park Gaffey St. and 36th St.
Louise Park 7140 Louise Ave.
MacArthur Park 2230 W. 6th St.
MANDEVILLE CANYON PARK End of Westridge Rd. MASCOT PARK Mascot St. & Pickford St.
Mason Park 10500 Mason Ave.
Media Park Culver Blvd. & Venice Blvd. MISSION PARK 15174 San Fernando Mission Rd. MONTECILLO DE LEO POLITI PARK On Stadium Between Scott Rd. & Academy Rd. Moorpark Park 12061 Moorpark St.
Mount Carmel Park 830 W. 70th St.
3900 W. Chevy Chase Dr.
Palms Park 2950 Overland Ave.
Pan Pacific Park 7600 Beverly Blvd. PARK CENTER 4730 Crystal Springs Dr.
Parthenia Park 21444 Parthenia St.
PAXTON Park 10731 Laurel Canyon Blvd. Peck Park 560 N. Western Ave.
Pershing Square Park 532 S. Olive St.
Pico Union VEST POCKET Park 1827 S. Hoover St.
Porter Ridge Park Reseda Blvd. & Sesnon Blvd. Prospect Park Echandia & Judson St.
Rena Park 510 Leland Ave.
RESEDA PARKS 18411 Victory Blvd. Reynier Park 2803 Reynier Ave.
RICHARD ALATORRE PARK Figueroa & 134 Fwy. Ritchie Valens Park 10731 Laurel Canyon Blvd. Rivas Canyon Park Easterly Terminus of Oracle Pl. Roscoe/ValleyCircle Park Valley Circle Roscoe Blvd. Rose Hill Park 3606 N. Boundary. Runyon Canyon Park 2000 N. Fuller Ave.
Rustic Canyon Park Rustic Canyon Rd. San Pedro Plaza Park 700 S. Beacon St.
San Vicente Mountain Park 17500 Mulholland Dr.
Second Ave Park 2413 Second Ave.
SEPULVEDA BASIN DOG PARK 17550 Victory Blvd. Serrania Ave Park 20864 Wells Dr. SHADOW RANCH park 22633 Vanowen St.
1850 W. Silver Lake St.
Slavin (Jaime Beth)Park On Whitsett Ave., South of Strathern St.
Smith(Dorothy & Benjamin) Park 7020 Franklin Ave.
South Park 345 E. 51st St.
St. James Park Adams Blvd. & Severance St.
Stetson Ranch Park 13877 Glenoaks Blvd. Studio City Mini Park 12505 Moorpark St. at Whitsett Ave.
SUN VALLEY PARK 8133 Vineland Ave.
Sylmar Park 13109 Borden Ave.
Temescal Canyon Park 15900 Pacific Coast Hwy. Triangle Park Oxford Ave. and Marr St.
Erwin St. & Ethel Ave.
VALLEY PLAZA PARKS 12240 Archwood St.
Van Nuys/Sherman Oaks Park 14201 Huston St.
Verdugo Mountain Park East of Sunland, South of La Tuna Canyon Rd. Victory/Vineland Park 11100 Victory Blvd. Vista Del Mar Park Century and Vista Del Mar Blvd. Warner Ranch Park 5800 Topanga Canyon Blvd. WASHINGTON IRVING POCKET PARK 4103 W. Washington Blvd. Weddington Park (North) 10844 Acama Dr.
Weddington Park (South) 10800 Valley Heart Dr.
West Valley Park 6731 Wilbur Ave.
Westside Neighborhood Park 3085 Clyde Ave.
White Point Park Paseo Del Mar & Western Ave.
Wilbur-Tampa Park 12001 Wilbur Ave.
Woodbine Park 3409 Vinton Ave.
Woodbridge Park 11240 Moorpark St.
Woodley Ave Park Woodley Ave. and Victory Blvd.